Apple's new iTunes Match service will scan a user's library of songs, including those ripped from their own CDs, and match the songs up with the library of 18 million songs available through iTunes for $24.99 per year. When it launches this fall, iTunes Match will offer the same benefits to personally ripped CDs as is granted to music purchased through the iTunes Store. Apple's software will scan a user's hard drive to identify the music they have saved locally, and that content can then be re-downloaded to any device. Apple Chief Executive Steve Jobs boasted that the new service will take just minutes to match up songs with the cloud. He ribbed other, competing offerings from Google and Amazon, which take "weeks" to upload extensive music collections. As was previously rumored, users will not need to upload songs, as their content will simply be matched up with the high-quality 256Kbps AAC audio files Apple has stored on its own iTunes servers. Anything that can be matched up is upgraded to the higher quality, without any digital rights management. Any songs that don't match up with content available on iTunes will be uploaded and stored so that users can access them on the go. Jobs said that iTunes Match is an "industry leading offer," with a flat price of $24.99 per year no matter how many songs users may have on their computer. Shown in concert with the new service were photos of Apple's $1 billion data center in North Carolina. Jobs showed off the eco-friendly facility as evidence that Apple is "serious" about this new product. 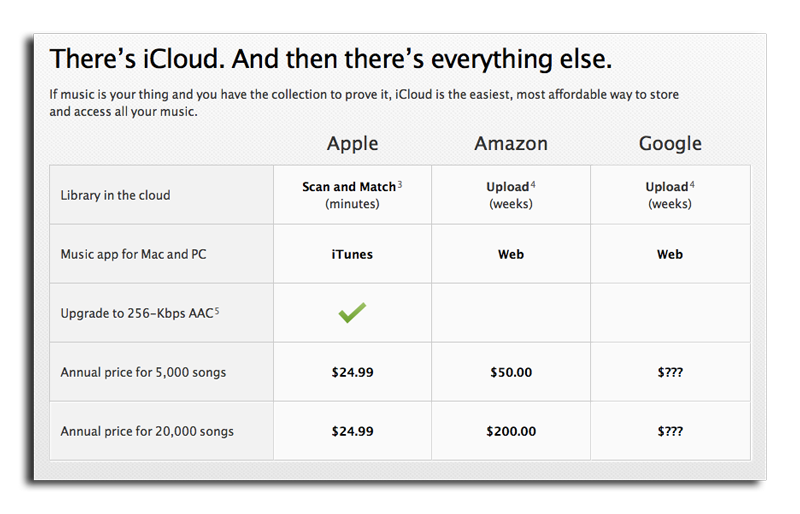 "If you want all the benefits of iTunes in the Cloud for music you havent purchased from iTunes, iTunes Match is the perfect solution," Apple's official promotional materials read. "It lets you store your entire collection, including music youve ripped from CDs or purchased somewhere other than iTunes. For just $24.99 a year. "Heres how it works: iTunes determines which songs in your collection are available in the iTunes Store. Any music with a match is automatically added to your iCloud library for you to listen to anytime, on any device. Since there are more than 18 million songs in the iTunes Store, most of your music is probably already in iCloud. All you have to upload is what iTunes cant match. Which is much faster than starting from scratch. And all the music iTunes matches plays back at 256-Kbps iTunes Plus quality  even if your original copy was of lower quality."